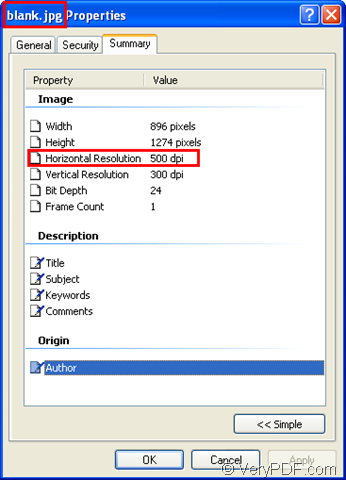 ← How to set the vertical resolution while converting emf to jpg? How to set the horizontal resolution while converting emf to jpg? 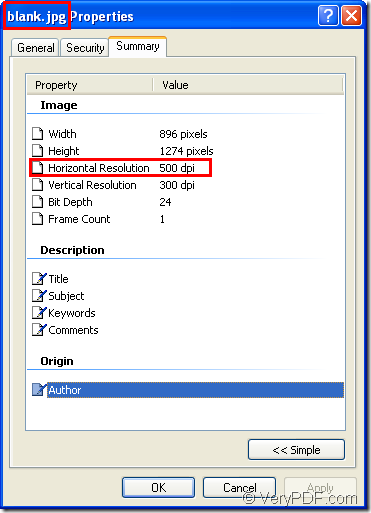 Resolution is used to display an image,which is the term used to describe the number of dots, or pixels.Higher resolutions mean more pixels are used to create the image and of course you will see a clearer image.The resolution on a TV monitor or mobile phone monitor is composed of thousands of pixels or dots. You may heard of 800 x 600,which refers to the resolution. This indicates that there are 800 horizontal dots across the monitor and 600 vertical dots.It equals to that the resolution setting on the computer monitor was set for 800 pixels wide by 600 pixels deep. If you want to set the horizontal resolution when converting emf to jpg format file,you should choose a a software which supports this function.HTML Converter Command Line is a such kind of software.It allows you to create previews or thumbnails of web pages in a number of different formats, such as TIF, TIFF, JPG, JPEG, GIF, PNG, BMP, PCX, TGA, JP2 (JPEG2000), PNM, etc. HTML Converter Command Line also allows you to convert web pages to PDF, PS (postscript), WMF, EMF vector formats.At the same time,you can use HTML Converter Command Line to set many kinds of parameters for the image file such as the width,height,resolution and so on. You can download HTML Converter Command Line at the website http://www.verypdf.com/htmltools/htmltools.zip. Now you can convert emf to jpg and set the horizontal like the following steps. 1.Run cmd.exe program by clicking “start”—“run” and input “cmd” in “open” edit box of the popup dialog.Then click “OK” button.Or you can press “Windows”+ “R” to realize the same function. NOTE:-xres here indicates the horizontal resolution.Of course you can consider it as the resolution in X direction. Please see the example which interprets the command line above in Figure1. "C:\Documents and Settings\admin\Local Settings\Temp\htmltools\htmltools.exe" is the path of htmltools.exe.You can drag the file into cmd.exe dialog box for convenience. -xres 500 is the value of horizontal resolution of target file,which you can set yourself. "C:\Program Files\docPrint Pro v5.0\blank.emf" is the path of source file. blank.jpg is the name of target file. 3.Find the target file in some location of your computer.The target file in this example will be saved in current directory because there’s no information about saving path of the target file in command line.Then you can right click the target file to see its properties.You will find the horizontal resolution has changed to 500 DPI after converting emf to jpg.Please see Figure2. How to rotate the page when converting EMF to JPG? How to set bit depth when converting EMF to JPG? How to set color depth when convert EMF to JPG? How to rotate the page while converting emf to jpg? How to set the vertical resolution while converting emf to jpg? How to set both the horizontal and vertical resolution while converting emf to jpg? How to convert format emf to jpg in a command line? How to make a thumbnail for html document? How to create a thumbnail for emf image? How to rotate the page when converting url to pcx? How to convert html to tga format? This entry was posted in HTML Converter (htmltools) and tagged emf to jpg. Bookmark the permalink.